My guest today, and for the next two weeks, is mystery writer Beth Groundwater. Earlier this year, Beth served on a jury in Colorado–an experience I’m not likely to have, at least while I’m still practicing–and shares her experience with us. Recently I had the wonderful (for a mystery author) experience of serving on a jury for a criminal trial. The three-day experience gave me an inside look at the Summit County, Colorado, criminal justice system, and at the lives and tribulations of what my mother would call “not our kind of people.” I’m going to blog about my experience today and the next two days, so I can share some of what I learned with other mystery authors and with mystery readers. I hope you find my experience as interesting as I did! The trial was a case of domestic abuse (the local newspaper article if you want to read the verdict now is here.) About three weeks prior, I received a jury summons to show up at the Summit County Justice Center on Tuesday June 26th, at 9:30 AM. After checking in and waiting for another twenty minutes or so, those of us who responded to the summons were all ushered into a courtroom. The judge informed us that 90 people had been summoned and 37 had shown up. She was not pleased. Then she went through a list of reasons why someone could be excused–doesn’t live in the county anymore (a few college students who were still away for summer classes fit this category), taking care of a disabled person, etc. Then she said the case involved domestic abuse and asked if anyone felt they could not be impartial in such a case. A few hands went up, mostly women, and she asked those people to discuss why with her privately in her chambers. Most were excused. That left just over thirty of us in the room. Then twenty-two names were called for people to come forward and sit in the jury box. I was thrilled when I was one of them, and I began thinking that maybe I would actually get a chance to serve. The prosecution and defense could each choose five jurors to dismiss, and the remaining twelve would serve. Next, each juror answered a standard set of questions, such as which town we lived in and for how long, if we were married or had children, our occupation and those of our spouse, children and parents, if we knew anyone in law enforcement, our hobbies, sports and interests, what we liked to read and watch on TV, and what sites we visited on the Internet. The judge usually had at least one clarification question for each juror, expounding on anything that might show a preconceived bias. Then the prosecution (two Assistant District Attorneys working together) and defense (a paid versus court-appointed lawyer) had about a half hour each to question the jury as a whole on issues or jury members in particular about their background or views. One of the Asst. DAs knew my name and about my RM Outdoor Adventure mystery series, but he was surprised that Beth Groundwater was my real name, not a pen name. I was asked WHY I wrote mystery novels, probably to see if I had any bias for or against cops or criminals or if I had preconceived notions of justice. I answered that I had tried other genres, but that mystery felt most comfortable for me, probably because I was a puzzle person. When one man, who had previous experience with domestic abuse, said he was very interested in serving on the jury, one of the Asst. DAs asked almost in jest if anyone else really wanted to serve. I deliberately did not raise my hand, because I did not want to appear overeager. That man was dismissed from the jury, but I was not. One interesting question we were asked by the Asst. DAs was what our reaction would be if they brought forward a witness that they were pretty sure would lie to us. There were some “Huh?” looks from some jurors at that point, as we wondered why they would call a witness they expected to lie on the stand. We found out later! Since we’re a low-population county, quite a few people knew law enforcement personnel or members of the court system. Also, one man’s sister had been a victim of domestic abuse. As I listened to these other jurors, I thought, okay that person will be dismissed over me. And that proved to be the case. The defense and prosecution had more compelling reasons to dismiss ten other jurors, and at the end of the voir dire (jury selection) process, I was still in the box! We were sworn in, admonished not to discuss the case with each other or other people, not to do any research related to the case, and dismissed for lunch. After lunch, the trial began and the prosecution presented their opening statement. There was no opening statement from the defense, and the judge instructed us that the defense is not required to provide an opening or closing statement, or call any witnesses or present any evidence. Nor is the defendant required to testify. The onus of proof is on the prosecution (the defendant is presumed innocent before proven guilty), and the defense doesn’t have to prove anything. We heard testimony first from the police officer who arrived on the scene after 911 was called by two of the victim’s housemates who came home one night in December, 2011 to find her laying in a fetal position on the sofa. The story that the victim told her roommates and the officer was that she and her boyfriend were drinking at a bar and got into an argument there. He returned to her place and waited for her while she finished her beer. When she got home, the argument began again and got physical. He punched her in the face and repeatedly kicked her, threw a skateboard through her bedroom window, broke her laptop computer, and stole her cell phone and winter coat so she could not call or go for help (the house had no land-line). The police officer had taken photos of the victim’s bruised face, the broken window, etc. and these were entered as evidence. Then, the victim got on the stand and told a completely different story. She couldn’t remember what she said to the police officer, claimed that she bruised her own face by tripping and falling on the stairs, and that during the argument she threw her own laptop computer through the window. Even when pressured by the prosecutor, who repeated statements she made to the police officer and which he recorded in his report, the victim stuck with her story. When asked by the prosecution if she still loved the defendant, she said that yes, she still cared for him and wanted to be with him, but was prevented from being with him (we later found out, by court order). I went home that afternoon thinking, well THAT was interesting! I had many, many unanswered questions from the conflicting accounts of what happened. 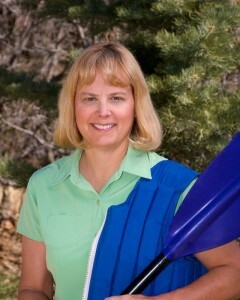 Beth Groundwater writes the Claire Hanover gift basket designer series (A REAL BASKET CASE, a Best First Novel Agatha Award finalist, and TO HELL IN A HANDBASKET) and the Rocky Mountain Outdoor Adventures series starring whitewater river ranger Mandy Tanner (DEADLY CURRENTS and WICKED EDDIES). The third books in both series will appear in 2013. Beth enjoys Colorado’s many outdoor activities, including skiing and whitewater rafting, and loves talking to book clubs. 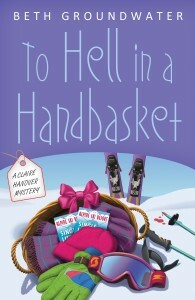 TO HELL IN A HANDBASKET will be re-released in trade pb and ebook on November 8th. You can find Beth online here. 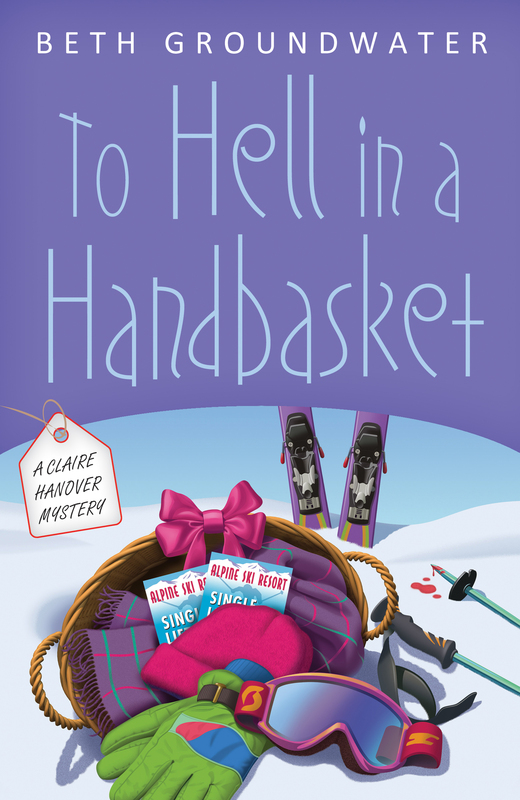 This entry was posted in Guest posts, writing about legal issues and tagged Beth Groundwater, jury duty, To Hell in a Handbasket by Leslie Budewitz. Bookmark the permalink. Wow, Beth! Great insight into the case. I can’t wait to hear the rest of your story. I’ve been called for jury duty many times both county and federal. I only got to servie on the federal case and it was settle out of court before the second day. We had just gotten to see some of the new equipment being used so the judge asked the jury members to evaluate the one piece of equipment we’d used before we were dismissed. I was sadly disappointed the clients had settle. For a mystery writer, you can’t get a better idea of how things are presented, etc., in the court room. It sure isn’t like TV. Pat, despite your disappointment, you got a valuable opportunity to see the inside of a courtroom and how it really works. The technology has changed tremendously in recent years. Thanks for your comment, and I hope you’ll come back next week and the week after to read the next two installments. One technology change that I noticed in the courtroom was that the judge had a computer in front of her all the time. The court reporter transcript was fed directly into it, so the judge could look back over previous testimony. Also, she had access to legal rules and case law on the computer, so when she had to make a ruling, she could do some research first. The use of “real time” technology, linking the court reporter and the judge, is one of the most important tech developments in the courtroom. Another is the use of computers to display exhibits–some jury boxes have monitors in them for jurors. Any of that in your trials, Beth and Pat? Being an observer in the courtroom is an amazing education, sometimes even better than serving as a juror. Observers get to stay in the courtroom to hear controversial aspects that attorneys object to, when the judge often sends the jury outside to prevent them from hearing potentially prejudicial evidence. But I’d still like to serve…sometime. Hey, Debbie , I’d put my fate in your hands any day! Thanks for your comment. Don’t give up hope yet. You may still get a chance to serve. If you get called for jury duty and are chosen to go into the jury box for voir dire, just answer the questions you are asked as truthfully as you can. The attorneys are mainly looking for bias, and if you have none, you may still get chosen to serve even if you know many lawyers and law enforcement personnel. Our jury foreman was the manager of the local ambulance service and knew loads of law enforcement personnel as a result, but he felt he could be unbiased and was left on the jury.